Part portfolio. Part design experimentation. Part blog. But all fun. Funbelievable is the place where you'll see some of our more whimsical ideas. From sketches to complete projects, if it's fun, it's here. Zombie TV dinner? Silver screen diva with an axe? Dizzy blowing his horn? We love riffing on client projects and pop culture to create visual "headlines" for our newsletter. To reward the fandom and celebrate the success of Cartoon Network's hit show "Adventure Time" (plus sell some DVDs), Cartoon Network created a limited-edition DVD that included a fleece hat like what the show's protagonist wears. We worked on developing and producing the packaging as well as the DVD title screens. It may be the Tooth Fairy's least favorite holiday, but we love it. 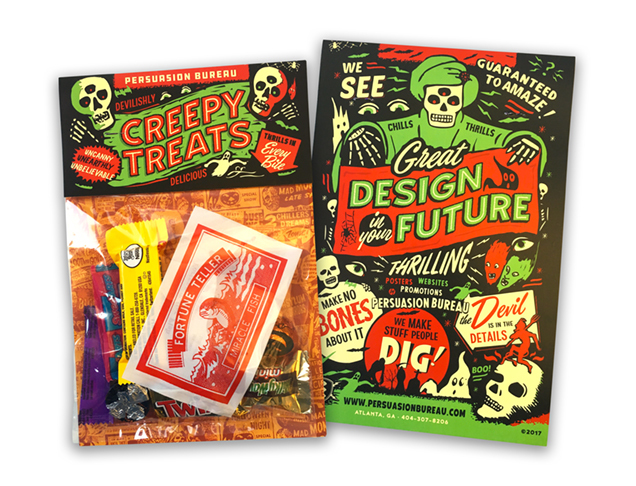 This year we sent out a retro candy sampler to our subscribers in a package designed inspired by old 1950s-1970s Spook Show posters. 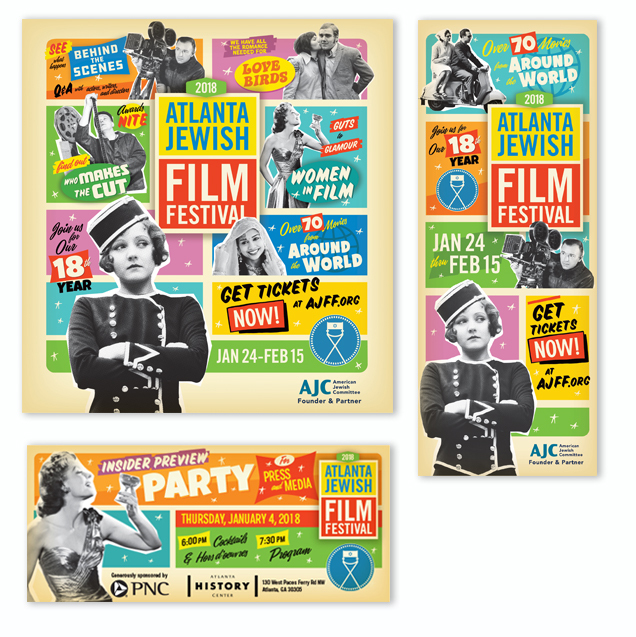 Inspired by a mash-up of classic Hollywood, nostalgic poster art, and old newspaper movie listings, we turned it up to 11 to get the word out for the 2018 Atlanta Jewish Film Festival. From print ads to bus shelters. From digital billboards to promos on the big screen. We're bringing the festival to new audiences and keeping it connected to old ones across Atlanta with this unique, neo-nostalgic vibe. We selected seven of our best design projects and magically turned them into glorious 3D pictures. 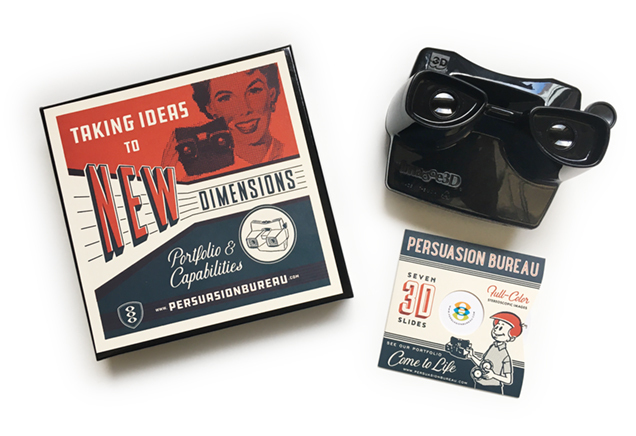 Then we boxed it up in a limited-edition letterpressed package with a View Master viewer. Behold, it's old-school VR at its finest. Click here to join our mailing list for future promotions like this. 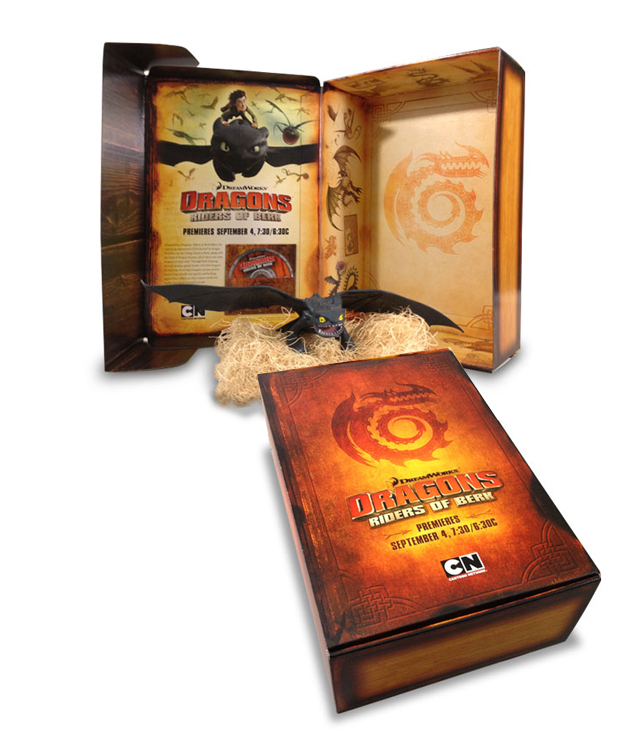 For DreamWorks/Cartoon Network's "How to Train Your Dragon" we designed a media kit box for their PR materials, screener DVD, and a toy dragon. The box was based "The Book of Dragons," a key element used by the show's main character. We produced the large box to make it look like the book used in the TV show. The interior of the box was illustrated with beautiful illuminated manuscript style dragons. To reward the fandom and celebrate the success of Cartoon Network's hit show "Adventure Time" (plus to sell some DVDs), Cartoon Network created a limited-edition DVD that includes a fleece hat like the show's protagonist Flynn wears. 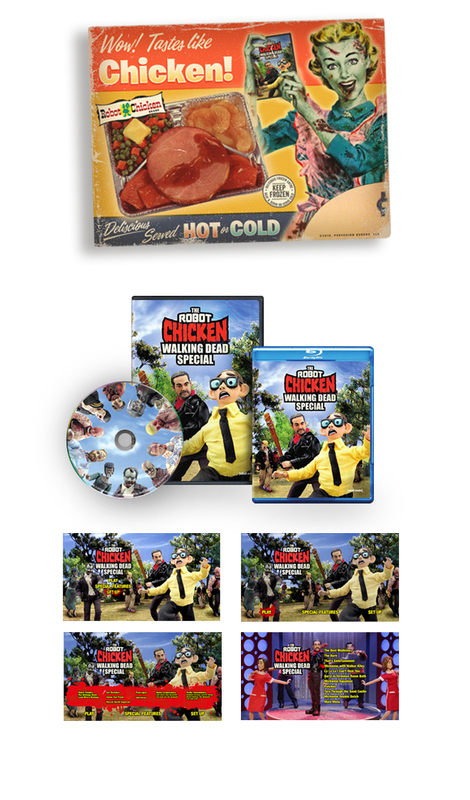 We worked on developing and producing the the packaging as well as the DVD title screens. If you're thinking of a promotional item that's hard hitting, this one is, literally. 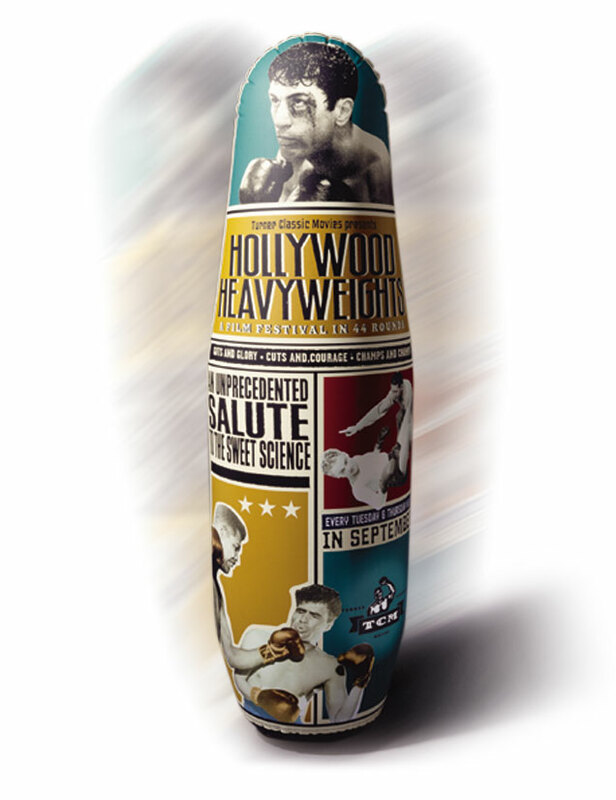 Designed as a B2B promotion for Turner Classic Movies' boxing-movie festival, this four-foot-tall punching bag was shipped inflated in a huge box to over 300 cable affiliates. Talk about impact. Pow! We also created a consumer marketing campaign featuring advertising in national magazines that incorporates the same distinct visual style. What happens when you mix a shot Humphrey Bogart, a dash of Lauren Bacall, and a pinch of the great movie poster artist Saul Bass? It's a "Recipe for Trouble." 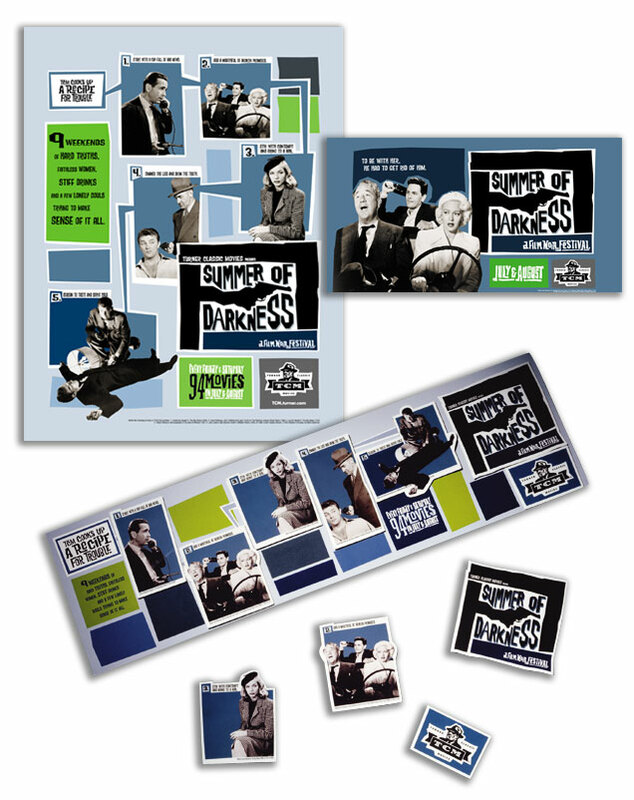 The TCM "Summer of Darkness" was an on-air, summer-long film noir festival featuring the "darker side of human nature." Despite being a popular genre, selling something this dark could be poison for ratings. Our antidote, lighten the mood by developing a playful campaign inspired by many of the movies' pulpy characters and campy one-liners. The campaign included a consumer ad campaign in newspapers and national magazines, movie theater trivia slides, on-air bumpers, and promotional items like refrigerator magnets, tote bags, and t-shirts for live film screenings in select cities. Who Doesn’t Love Dinosaurs (and Cavewomen)? We love campy old movies. We love dinosaurs. We love vintage movie posters. So when designing the Maker-Faire Atlanta booth for Jurassic Arts, we put this together for a little bit of fun. Based on the poster from Hammer Studios 1970 film "When Dinosaurs Ruled the Earth", we rebuilt the illustration and created a new title treatment for our version. It was just a one-off poster, but I was amazing how many people wanted to buy it. Watch the trailer for a hoot! Often when companies start owners produce all branding and artwork themselves. Or they use a patchwork of friends and freelancers to do it. But as their business grows, they find they need to more efficiently allocate resources and delegate responsibilities. This is when they usually turn to reliable design and branding professionals. We are a perfect fit for this next step. We are a small agency with both specialty product and big-brand marketing experience. We can take products and services to the next level and support them when they get there. We produce innovative and exciting solutions that speak to the ways customers define themselves. 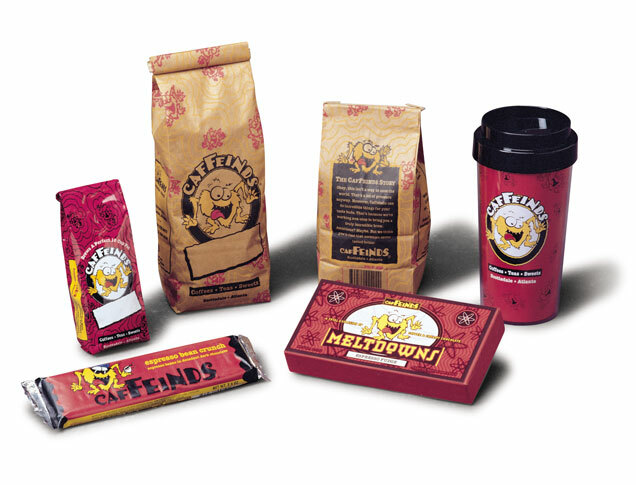 The Caffeinds packaging illustrates how we helped an independent coffee shop go from hand stamped and stickered bags to a retail-savvy brand sold in their store and online. Over the past 8 years we have designed over 50 DVD packages and their onscreen navigation. Designs include packaging for educational films and study materials, entertainment industry B2B marketing, and retail consumer entertainment. We've developed retail DVD packaging lines for popular TV shows, special edition box sets, as well as DVD packaging guidelines for TV serials. Many of our box sets and collectors editions have won both national and international design awards, and have been featured as examples of design excellence in books and publications worldwide.